Two horrendous videos emerged from Hebron over this past deadly weekend. In one, after a 14-year-old girl was gunned down in the street, an ambulance waits right next to her as she bleeds and writhe on the ground, but soldiers prevent her from being moved. In the other video, a soldier is recorded callously pushing over a disabled Palestinian man in a wheelchair. Ma’an news reports that “local Palestinian sources” said the girl, 14-year-old Yasmin Rashad al-Zarou, was walking past a military checkpoint with her sister when Israeli soldiers shot her a few meters after she’d crossed the checkpoint. She was walking away from the checkpoint when they fired at her. An Israeli police spokesperson said Israeli forces had shot at al-Zarou after an “alleged attempted stabbing attack”, however, there was no mention of who she allegedly tried to stab. The other incident, again in Hebron, occurred after Israeli forces shot and seriously wounded 14-year-old Yasmin A-Tamimi, after she reportedly “drew a knife, tried to stab one of the officers at the roadblock”. As Palestinians approached the scene an Israeli officer pushed a disable man in his wheelchair to the ground. A video documenting the moments after the attack shows Israeli forces pushing away and shouting at the Palestinians approaching the scene. After a few minutes, a Border Police officer is seen pushing a wheelchair-bound man to the ground, and his head hits the pavement. Several Palestinians approach, and the video shows another officer trying to kick another Palestinian away. Then it seems as if a stun grenade is thrown, and the Palestinians are seen running away……. Killing young girls and attacking someone in a wheelchair. I could see Nazis doing these things. What’s the difference? No difference. They are all vicious, inhumane killers. At any rate– ridiculous, hypocritical thugs who make their own beds and those of any Israeli Jew in the occupied Palestinian West Bank who sides with the occupation and the “settlement” project. The Israelis must be stopped by outside forces. IDF has morphed into storm troopers. The tragic clarity of this is an assault of the human spirit. As the Israeli psychosis spreads one wonders how Germany and the US can continue to remain silent. Oh… almost any western democracy would do. Eventually they will as people continue to become educated as to the nature of Israeli fascism in its expansionist illegal settlement. They are free to live in their own home. Too bad blood thirsty Israelis employ them to kill innocents outside of their own home. Al-Khalīl is a West Bank city a part of the purposed Palestinian state not a part of the ‘nation of Israel’. talking about delusionary. Germany, well at least Angela Merkel, has spoken and she sounds an awful lot like a sell out. BERLIN — The current climate in the Middle East does not allow for major steps toward the creation of a Palestinian state, German Chancellor Angela Merkel said here Tuesday, calling instead for small steps to safeguard a future two-state solution for the Israeli-Palestinian conflict. “Now is certainly not the time to make really comprehensive progress, but you can achieve improvements in certain places,” she said at a joint press conference with Prime Minister Benjamin Netanyahu. During the press conference, Netanyahu rejected a French initiative for a regional conference to discuss the stalled peace process, arguing that the move was doomed to failure and that bilateral negotiations to peace are the only path to Palestinian statehood. Earlier in the day, French Ambassador Patrick Maisonnaive met in Jerusalem with Foreign Ministry political director Alon Ushpiz to present Paris’s plan, first announced by then-foreign minister Laurent Fabius, to convene a regional peace conference. If the conference fails to lead to a significant advancement toward the two-state solution, France will unilaterally recognize Palestinian statehood, Fabius had threatened. “It says: We will hold an international conference but if you do not succeed we are already predetermining the result – we will recognize a Palestinian state,” he said. The initiative does not take into account several issues of crucial importance to Israel, Netanyahu lamented. “It does not matter. We will determine that there is a state, without any conditions regarding recognition, security or anything,” he said sarcastically. Netanyahu denied that the EU’s foreign policy chief, Federica Mogherini, had spoken with him about a planned report containing suggestions on how to jump-start the peace process. Netanyahu said Jerusalem’s relations with the EU were improving, citing a recent conversation with Mogherini in which the two tried to mitigate the tension over Brussels’s decision to label West Bank goods. Completely off topic but am wondering why, when you respond to someone, you don’t show the courtesy of using their entire name as written? If it’s too hard to do, you can cut and paste it. I think you do it to be insulting, but why I think that is anybody’s guess as you come across as such a sweetie. @Marnie: Germany, well at least Angela Merkel, has spoken and she sounds an awful lot like a sell out. Well it seems it is all an act. US/UK/EU/UN pretends that they believe the zionists when they say they want peace, but deep down they know it all zio bull, so they stall and mark time for them, so that the nazios can complete stealing all Palestinian lands and resources, which should be quite soon. They they will play the “Oye Vey nothing can be done for the Palestinians anymore card”. Even if Merkel brought this subject up, the Butcher of Tel Aviv, would have reminded her that Germany owes the Jews so much, and remind her yet again of the holocaust. A reprimanded Merkel would then shut up. Those who still believe that the Palestinians will one day have their own state, is simply being naive. Time for the world to face reality. Speaking of tyrannical delusionary idiocy – coupled with Zio-supremacist hatefulness and immorality – there’s no reason it should be the job of Israeli soldiers to engage in and/or enable the theft, occupation and colonization of land outside of Israel’s / Partition borders and the oppression, torture and murder of non-Jewish Israelis and non-Israelis. Except that Israelis aren’t just “living in their nation” – they’re also living in the non-Israeli land (outside of Israel’s / Partition borders) that they’ve been stealing, occupying and colonizing for almost 70 years. Comments at TOI (I think it was) were saying that the guy in the wheelchair deserved his treatment because he has been at several demonstrations. They they also pointed out that the girl is being treated in an Israeli hospital. No one thought they was anything wrong with pushing the wheelchair over, in fact one man said that they should have shot everyone and not left witnesses. Democracy! Hypocrisy in rhetoric and bloody-minded statements is one of the lesser hypocrisies within the greater one. These are the people who brown their pants because Palestinians in Gaza call Israeli Jews “Jews”. And yet they think it’s fine to get up for all to see and spew their ridiculous, evil filth about Palestinians and Lebanese people and indeed Arabs and non-Jewish Middle Easterners in general. MY COMMENT: It seems as though young Palestinian women/girls are being targeted by the IDF. I can’t help but recall this notorious T-shirt. Truly sickening. Not an ounce of morality in sight. Brutes and thugs. They do seem to be targeting more women and girls now. Is that because more women and girls are stepping up or is there a change in how Jewish Israeli males view Palestinian women? What exactly do you mean by stepping up??? They are attacking young girls and recently killed two others. And they’ve shot little girls multiple times. What possible excuse could there be for murdering and attempting to murder young girls? How does a young girl pose a threat to a fully armed IDF soldier? And do they have to shoot to kill? The truth is that these girls are the future. They will marry and have babies; but the murdered girls won’t, will they? This is the real reason for murdering young Palestinian girls. Killing a young Palestinian girl is an opportunity that doesn’t come along every day for them, so, shoot to kill! Is there a change in how they view Palestinian women? No, they still view them as less than human. We know that Palestinian girls carry invisible knives. Can’t take the risk that they might be carrying invisible AK47s as well. Being vicious is part of the zionist psyche. It is sickening that the zionists keep justifying the killing of civilians citing “attempted stabbings”, which knowing what liars they are, are highly suspicious. In the land of zionists, it seems anything their leaders or military says, is acceptable. The difference in the way they handle their people versus these poor Palestinian kids is not only obvious, but deplorable. Still waiting for the groundbreaking story about the infamous ‘plan mem (M)’ whereby military leaders hatched a plot( all the way back in ’48) to plant knives on all adolescent girls between ages 12 to 18 so as to allow them to be shot with impunity. P.s. reports circulating that the invalid in chair is really an undercover israeli shan’t and the chair flip was just theatrics. Palestinians with knives isn’t a plot – it’s what happens when hateful and immoral Zio-supremacists like you spend almost 70 years (and counting) oppressing, dehumanizing, torturing and killing people while stealing, occupying and colonizing their lands. I know: Why can’t they just lie back and enjoy it, right? But they don’t, so you keep beating them down – they keep making you beat them down! – and then people say you’re the “bad guy”. And that’s just not fair! Yeah circulated by the same people who said that Muhanmad Abu khdeir was killed by his family in an honor killing and the Duma arson was an Arab family feud. P.S the man in wheel chair is Majid AlFakhouri and he said he will file a complaint. Zaid, let’s give the devils their due – they are expert at spinning, lying, and blaming the victims. If you take the Turkish flotilla case – the lying zios first made out that (even after their masked thugs jumped from helicopters on the boats) they were attacked first, then they blamed those poor people for their own murders, they confiscated all videos to erase their violence, then they went on to doctor audio tapes (which they admitted afterwards). They sure know how to make the lies bloom not only in the dessert, but also over international waters. Waiting to see how someone could justify this. Flipping wheelchaired people over, truly the most moral army in the world. Not a mention of the word occupation, and it all happens because Palestinian attackers can pretend to be disabled. Wow. There’s a pesthole with comments worthy of the kind you might find on youtube videos posted by the IDF’s official channel. They’re not even afraid to start ranting about “dirty” Arabs and how anything that makes Israel look bad must be “faked”. I thought newsweek was fairly mainstream– I suppose the scum must sniff out the articles they can all congregate on? That newsweek reporter is a disgrace. He simply spouts what he’s been told, not that that is any thing new, of course. Clearly he doesn’t know how to use such words as ‘alleged’, or border police ‘claim’ etc. This great ‘moral army’ – I’m assuming they claim the same for their police – can’t even disarm a fourteen-year-old girl? Unbelievably despicable. Yet, we have to feel sorry for their ugliness: they can’t be very happy; I suppose that’s what comes from being told that everyone hates you from a very young age. Damn, that Newsweek article is pretty bad, even for Newsweek. Wow, attack and attacker crammed into one sentence! Also how do we know she tried to stab someone? Because the Israelis said so and they never lie. Also I think it cute that he reminds us of the dude who disguised himself as a reporter, gotta make sure to get that in. Idiot. I see the ‘Newsweek’ report quotes Hasbara pin-up boy and part-time matinée idol Micky Rosenfeld, “A few minutes after a TERRORIST ATTACK [my emphasis] had taken place by a WOMAN TERRORIST [my emphasis] adjacent to that area, a crowd gathered and attempted to get into the area where the attack had taken place.” Oh, well; in that case, it must be true………. Well, what do you know? “Jon s” must have told them about the “terrorist attack on Beersheva” trick!! Another demonstration of the heroism of the brave lads of the IDF as they resolutely defend freedom, democracy, and Western values from the growing menace of Islamic terrorism. Platosguns lifted the “article” about the supposed letter from Clinton to Saban from a site called “The Mideast Beast”. The Mideast Beast (TMB) is a satire and (dark) comedy news site that produces spoof articles about or connected to the entire Middle East for comedic and entertainment purposes. We poke at anyone and everyone. I know the temptation to make Clinton out to be the vilest of all viles, but if people can’t recognize an “Onion” type piece of satire when they read it, then they have obviously gone way overboard. The more I read “The Mideast Beast” the more it sounds like a satire site with a decidedly Zionist bent, BTW. Markedly soft on Israel, and harsh in the satire against those who criticize it. I’d suggest that Taxi not use that site as a source for anything, even satire. Imagine an elderly disabled jewish wheelchair bound man being kidnapped tortured then dumped over the side of an ocean liner. Imagine something incredible like that. …. Imagine how utterly unjust and immoral that one act is. And then imagine how unjust and immoral are Zio-supremacists and their oppressive, colonialist, expansionist and religion-supremacist “Jewish State” for having spent the past almost 70 years committing similar – and worse – acts of injustice and immorality. Thanks, DaBakr, for putting this into perspective. An elderly disabled Jewish wheelchair-bound man was victimized decades ago, so it was okay for the IDF thug to push over a Palestinian in a wheelchair this week. Also, Anne Frank died when she was a teenager, so it was okay for the IDF to murder this Palestinian girl. Which is why it is okay for anyone to kill anyone, at any time. Right? The typical tactics of a rabidly pro-Israel Palestinian-hater. Bring up a solitary example of something that happened nearly thirty years ago to try and distract from the widespread abuse of Palestinians, able-bodied or otherwise, by the Israeli occupation forces, especially if there’s photos of videos of that abuse in action. Your idiotic non-sequitur aside, what would your excuse be if it turned out that the man your IDF thug flipped over died when he hit his head? I’m curious in kind of a sick way. 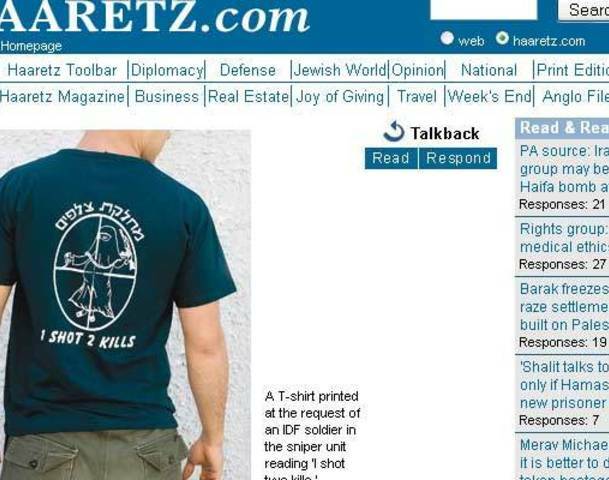 So great to see an acknowledgement from you that the idf is as moral as thuggish terrorists. Hopefully the message will go out to those non-Jewish disabled people who are planning to visit the Land of Creation that the most moral,light unto the nations and all that crap have inbred Nazi type contempt for the disabled. Additionally I hope that details of this incident gets spread amongst the disabled sports bodies throughout the world who are considering taking part in Israeli organised competitions or inviting their Israeli counterparts to take part in theirs and will lead to boycotts. Hey guy,s , give these poor hard done by squaddies a break.They are God,s chosen people doing the work their God chose for them. Wasn’t there a huge protest against an opera named “The Death Of Klinghoffer”, with a Jewish man in wheelchairs, Mr. Klinghoffer, killed by terrorists, and a chorus out of Palestinians singing about their suffering? Sounds to me that we have a new libretto for such an opera “The humilation fo Majid al-Fakhouri at Hebron”, the chorus will be heavy weaponed Israeli Border policemen whining about the attrocities against them forced by14year old Palestinian grils. “—-Justice Ministry department for the investigation of police officers, which has launched an investigation.” And we can expect them to ’round up the usual suspects’ and ‘exact justice on the perpetrators’ . Why do the Israelis even bother to put out this bull*%&t? Who, but the most self-deluding morons, really take this stuff seriously? Actually Hebron is in Israel. Except that, actually, it’s not. Why do you bother getting out of bed, @MaxNarr, if this is the best you can produce for your employers? In the Ziopathic fantasies of many Israeli leaders, including Mr. M. and most (?all?) of the present Cabinet, Hebron is in the mythic “Eretz Israel”, encompassing the whole of the West Bank and Gaza; doubtless extending northward to the Euphrates and southward to the Nile (“Why only as far as the Nile?” – Naftali Bennett). To the rest of the world, it’s a major Palestinian town in the illegally-occupied territories. Don’t you ever forget that Jews were ethnically cleansed from their homes in Hebron in the 1920s, we have returned, and we are NEVER leaving. 1. Nothing – note even the right of Jews who were ethnically-cleansed from Hebron in the 1920s to return to Hebron – constitutes a right for all people in the world who happen to be Jewish to occupy and colonize all of Mandate Palestine. “Thousands of Israeli troops evicted Jewish settlers from the Gaza Strip today amid anger, grief and isolated acts of violence. The actual removals – which have seen troops dragging some settlers out kicking and screaming – have taken place amid high emotion but little physical confrontation. Tell us max , are you one of the squatters [..] drag you kicking and screaming off the land you stole .The thought certainly a pleasant ring to it. “amigo”, I’ve tried and tried. They just won’t visit the “Wailing Wahl“. Feh, maybe they think they are hippies. Who knows? BTW, the US State Department report on the 1929 Hebron massacre is cataloged under the title 867n.404Wailing Wall/6: Telegram The Consul General at Jerusalem (Knabenshue) to the Secretary of State, August 25, 1929. It is my opinion that the Moslem attacks were precipitated by provocative acts of the Jews and that disturbances throughout the whole country will rapidly become general and brigandage will become rife if adequate forces are not rushed here from Egypt. I request a telegraphic acknowledgment. We’ve all witnessed the Zionist nut cases today marching to the Western Wall singing and chanting about butchering the Arabs. @MaxNarr, “never” is such a long time, habibi…… I’m an optimist & am fixing on living for at least another 10 or 15 years, destiny permitting; I believe I may live to see the end of the Occupation – or, at least, the beginning of the end. I read once or twice about a “Thousand Year Empire”; if memory’s correct, it lasted 12 years. No great surprise that the footage begins only a few seconds before it happens… We wouldn’t want the viewer to see what precipitated the incident. When children, women and the disabled are used to blow up Jews, Jews are rightfully fearful of children, women and the disabled. This man can thank Hamas and Abbas for his treatment. I don’t suppose you can back your statement up with something called facts and you’re talking about israeli Jews so don’t be so sloppy. I like your logic though, because I believe that the families of every israeli Jew that has been murdered can thank every prime minister of israel for their loss, most notably Benjamin Mileikowsky. Thanks Bibi! Yeah I’m sure that dirty wheelchaired man talking to the soldier did something to deserve his abuse. Totally. It’s not like the idf has ever committed massacres and dozens of human rights violations. Also, are you going to back up your accusations or are you going to disappear like most zionists do when they need to put in more effort than just smearing? “Diasp0ra”, of course he is! Next he writes back ‘I answered in great detail, but Moderation would not pass my response’. …non-Jews are rightfully fearful of Jews. Jewish people can thank Zio-supremacists like you for their treatment. Could our Hasbara regulars please be so kind as to re-evaluate their feelings about the death of Leon Klinghoffer now that they have enlightened us about the danger posed by men in wheelchairs?